On December 24th, 1999 Microsoft was trading at $58.719 a share. In the decade plus since, it has generally traded for approximately half that valuation. As I write this, a single share of MSFT can be had for $30.90. The stock’s general malaise has been attributed to different factors over the years. From the Innovator’s Dilemma to the misjudgement of the internet opportunity to questions about leadership, the cause of the company’s stagnation depends largely on who you ask. One possibility that is rarely discussed in this context, however, is that the value of software broadly is in decline. Maybe it’s not just Microsoft, but the market around it? There is a great deal of evidence to suggest that this is the case. The Top 20 firms that sell software, as measured by PwC, are, on average, 47 years old [coverage]. The youngest of them was founded in 1989. Even allowing that this is due in large part to normal merger and acquisition patterns, in which large companies effectively outsource risk to startups, the fact is that the market has not generated a large technology vendor oriented around selling software in twenty-two years. The next generation of large technology companies, meanwhile, not only have chosen not to sell software, they behave as if the software itself is of little economic value. Google’s publication of the Google FileSystem and MapReduce papers, for example, allowed an erstwhile competitor to build Hadoop. Android, the primary challenger to Apple’s iOS, is made available for free. Facebook built Cassandra to manage its Inbox, released it as open source software, and then replaced it with open source software originally written by a startup acquired by Microsoft. Twitter is up to 77 public repositories on GitHub. Even traditional vendors appear to be hedging against potential long term declines in either revenues, margins or both from software licensing. There is a reason that Oracle is willing to bet $10 million per account to push an appliance that combines hardware and software: their margins will be better than with standalone software, over time. Just as there is a reason that IBM’s Watson artificial intelligence offering is not available as an off the shelf SKU – and it is not simply the complexity of the product. It is reasonable to assume that IBM, a company that once manufactured typewriters, is in part planning for a future in which realizable software revenues may be compromised. To illustrate this, Raikes told the story about his decision to leave Apple for Microsoft in 1981. Walking down the Microsoft hallways for his interview, Raikes said, he was struck by the variety of computers in the building — from Radio Shack, Wang, Digital Equipment Corp., and dozens of other hardware manufacturers. In contrast, Apple was creating software to run on its own hardware, which remains a key difference between the companies to this day. With Surface, Microsoft is no longer making software for all of them. Having seen the field bested by Apple, it has decided to bet on itself. In the wake of the launch, industry observers have hastened to point out that this far from Microsoft’s first foray into the hardware space. From mice and keyboards to the Xbox and Zune, Microsoft has tactically engaged in hardware markets where it perceived need, opportunity or both – with a decidedly mixed track record. But from a revenue perspective the firm has never been about anything but software. Think about a post-PC future exemplified by the iPad. Apple sells the iPad with a nearly 33% margin but at a higher average price than Microsoft’s software bundle. Apple gives away the software (and apps are very cheap) but it still gains $195 in operating profit per iPad sold. That is a future which is problematic for Microsoft, for obvious reasons: the company that has largely been built on the backs of Office and Windows must become more like Apple to compete. But the trend that Microsoft is pivoting in response to will have far wider ripples across the technology landscape. On a list of major technology vendors, we are tracking nine with a market capitalization north of $60B. Of these, one third – Microsoft, Oracle and SAP – could plausibly be argued to be driven primarily by revenues of software sales. Of this subset, two – Microsoft and Oracle – are trying to diversify their businesses away from software based revenues; the former through Surface, the latter via Exadata. 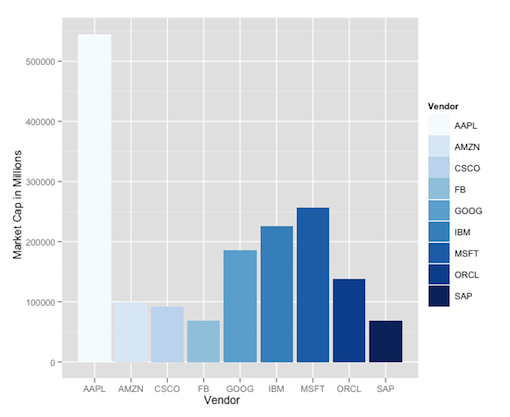 Which leaves SAP as the lone software focused large technology vendor. Software licensing is and will remain a viable revenue stream for the foreseeable future. But both public market valuations and observed behaviors of strategic software players indicate that the days of software licensing as a primary revenue stream are potentially over. But while that may seem a Cassandran prophecy, the valuations of Facebook and Google in particular – the former’s post-IPO crash notwithstanding – point to the next frontier in revenue: making money with software rather than from software. Data, in in our view, is the most likely – and practical, given the challenges of the hardware business (see Oracle’s integration of Sun) – near term replacement revenue stream for most software businesses, particularly those best equipped to maximize distribution: open source and Software-as-a-Service players. The future we forecast in 2007 is here, right on schedule, five years later. If the world’s largest software firm pivoting into hardware doesn’t convince you that the world is changing, my question to you is: what would? Disclosure: IBM and Microsoft are RedMonk customers. Apple, Facebook and Google are not. Great article Stephen. 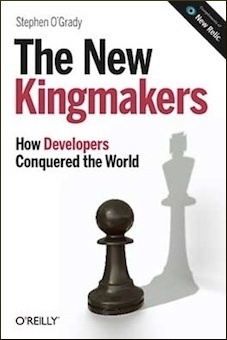 Would you think more than a decade of open source software devlopment plus crowd sourcing has something to do with selling software only model not sustainable or it’s the other way round. I would say the former, to some extent.. Almost all the software you need to build something useful and interesting is now freely available in open-source form. Hence, software per se is now infrastructure, so it’s what you do with it that counts. Without debating the other points you made, your use of stock price as a metric is misguided. Price is a function of emotion and investor’s guesses, earnings are function of what people are willing to pay fro something. I don’t have 1999, but ten years back in 2002, MSFT had $28B in top line revenue, this year they are on track for $73B that’s real growth. 3x growth through two downturns strikes me as pretty good. That it does not show up in the stock price says more about the “geniuses” on Wall St overvaluing it 10 years back and undervaluing it now than it does about Microsoft. Over that time Microsoft has managed to maintain its 30+% profit margins and increase its Return on Equity now north of 40%. On top of that Microsoft begun paying a dividend (and probably led the way for Cisco, Apple and others), their dividend is 2.6% currently which 30% higher than the market average. They’ve returned over $3.25B in cash to their shareholders via dividend, and raised it every year since inception in 2003. The 2003 dividend was $0.08/share, its not $0.72/share – that’s not fake growth that’s a sign of a healthy business. (note – I am not debating your other points which I find quite interesting just the use of stock price). Thanks for the note, and for taking the time to reply. I think we’re arguing about two different things. You’re looking for actual value, while I’m interested in perceptions of value. I concur that for analysis of a given entity’s actual value, share price is a problematic metric. Its vulnerability to sentiment, among other issues, makes it an imperfect metric for rigorous financial analysis. The crux of my argument actual is not however about rigorous financial analysis, but rather what valuations the market is applying to software based businesses more broadly. Whether those valuations are based on appropriate or unrealistic assumptions isn’t my primary concern. I’m focused, in this case, on what the market believes technology businesses are worth, and how it’s valuing – or not – those that derive the majority of their income through licensing. For all of its imperfections, then, it seems to me that market cap is the appropriate metric, because at its core it is measuring what the market believes a business is worth at any given time. Nothing more, nothing less. It’s important to note that i’m not making value judgements on whether the market should or should not value companies relying on software licensing. My opinions are academic relative to the market’s, obviously. As a result, I am merely trying to understand what those “geniuses” judgements are, and to adjust my outlook and my analysis accordingly. 1) VMware seems to be missing from PWC’s numbers – a $4Bn software business. If they’re added back in, then the “most recent founding date” leaps forward to 1998, which weakens the core premise. 2) The second problem with the “most recent founding date” and “age of software companies” as metrics is the effect of acquisitions. The original founding date of the acquirer is recorded, not that of the acquired software businesses, which may have subsequently grown to be significantly large inside the acquirer. This gives a false sense of the age and recency of some very strong, successful fast-growing software companies, almost none of them open source, that just happened to be acquired. What would happen, for example, if Veritas’ founding date was considered instead of acquirer Symantec? I could go on, but you get the idea. 3) An alternative explanation is that companies that focus on proprietary integration — regardless of whether they are software companies or not — are the ones being successful because they focus on end-to-end integration of whatever it takes to solve a customers’ problem. That’s where their proprietary advantage comes from, after all. That explains Microsoft’s move, but it would also imply that Open Source is in fact less relevant to value generation, because the one thing nearly all open source projects utterly fail to do is deliver a polished, well-integrated product focused on solving end customer problems. One might instead conclude that Open Source delivers free infrastructure components for proprietary companies to integrate into finished products at high margin. I don’t proclaim to have the answers, but it is nevertheless a fascinating debate. 1) People often point to VMware in these discussions, and with good reason: it’s a big software business. It’s not in the top 10 most valuable technology businesses, however. Google, founded in the same year, is 5X as large on a non-software sales revenue model. Which means that VMware is a good example of a software business that was founded relatively recently, but also evidence that it’s more difficult to grow a software licensing business today than it was a few decades ago. 2) Acquisitions, likewise, are commonly used to disprove the contention that licensing is a model that’s in decline. The problem with that argument is that while the software licensing business model has not generated a standalone business in the past twenty two years, software derived businesses have generated two in the last fourteen years: FB and GOOG. Both of which were compelling enough businesses that they were able to remain independent and grow quickly, unlike their software licensing counterparts. 3) Integration is indeed where a lot of the proprietary focus lies, and with good reason. The evidence doesn’t suggest, however, that this will generate a top ten business any time in the near future. I think the “market cap”chart is not the right tree to hang either the software or hardware premises of this article on. I’d have rather seen a chart that aggregated the revenues/profits of clusters of companies: for example, a cluster of all the major PC vendors: Acer, Asus, Dell, HP, Lenovo, Toshiba, Samsung, etc. And, how about a cluster with all revenues/profits of all companies selling Android based devices in whatever form-factors. Then you have companies that are unique exceptions to your maxims: like Adobe, where PhotoShop, today, is a very different (endlessly deep functionality) product than it was ten years ago, and one which people will pony-up US $1000 and more to upgrade to, or buy. Another factor not considered here is the scale of world-wide piracy of software of all types: just as its effecting the music publishers’ bottom-line, you can be sure availability of hacked/cracked latest versions of almost every software and OS ever invented for not much over the cost of the CD, or DVD, media it is sold on … is affecting software revenues. The article also ignores the major push (by Intel) for the upcoming “UltraBooks,” which will run Windows 8 (which may be a colossal flop, given the mutually exclusive two OS’s, Metro, and Win 8 desktop, embedded, like two personalities in a schizophrenic, in hardware that runs on Intel CPU’s ? As of yet, there is no clear information regarding the tablet’s history, internal development, marketing strategy, pricing, availability, performance, and to what extent it may be, as you hint at: a “reference design” whose purpose is shake the big manufacturers up. This is a popular analysis by those with a grudge against Microsoft. Other commenters have added their views on the erroneous assumptions but there is another egregious error: Microsoft pays a dividend. That is, a massive proportion of the company profit is paid out as a dividend. This makes it a stable stock and one beloved by pension funds which are able to rely on a relatively stable payment quarter in, quarter out. This also means the company cannot take the risks so is not as popular with the Wall St type of investor – maybe ones pumping out stories like this. Let me pick up on the ‘software in decline’ aspect. There are few good free software products. Sure you can name Linux, Apache Web Server, PHP, Java, Xen, some Python implementations, Asterisk, etc. There is a pattern here. The good free software is that required by the geeks, it’s self interest. Even then it’s not uniformly good. I use both Microsoft Exchange and the free SMTP server Postfix so I can use Mavis for virus checking. What a disaster. Sure, it works, but only after you’ve mastered its arcane files and syntaxes (note: plural). Of course there’s loads of documentation to help with the learning process: not. There are thousands of utilities to check CPU performance, show the time, stock prices and so on. While these may seem magical to the general user these are trivial for a programmer to create so are almost hobbyist. Move away from core services into retail applications or enterprise software and there’s nothing to write home about. Sure a Linux afficionado will tell you about Open Office but its not in the same league as Microsoft’s Office. Nor is that surprising. Microsoft need only focus on one platform while the unpaid Open Office team must consume precious resources testing on the massive proliferation that is Linux. What about Gnome or KDE? Clunky and barely usable does not even begin to describe these UIs. Gnome 3.0 has been mauled by no less a figure that Linux Torvalds. Good software needs support. Ultimately, that support must put food on the table of the supporters either directly or indirectly. For core systems software the indirect model clearly works but only for the handful of leading offerings. For a limited number of mobile games it works also because they generate ad revenues (at least for a short while). But outside these havens there is little evidence your thesis holds up. Finally, let me add that Microsoft products make money for millions of others around the world. You can create products for the Microsoft platform without paying Microsoft anything (you may choose to because its more convenient but there’s not obligation to do so). Meanwhile, Apple take a share of a each developers efforts. Now, remind me how you make free software in an environment like that? MS’s stock is more about large volume with a dividend that is spread across what is basically 20 businesses. Each with it’s ups and downs, which basically have your “day traders” never looking at MS so it never really moves. Cause it pays a dividend but a small one due to large amounts of stock, single user investors don’t look to it, better off having a savings account. Now if you can afford to buy 2 million MS stocks, well enjoy the pay check which is more stable than your check from work. Also there have been shifts in MS stock value but were pulled down with buy backs and splits etc, so not a great value of any company. Especially when comparing an “apple” to “oranges” pun intended stock setup. Now fore the software losing value, Good software isn’t losing it’s value, the consumer market software is losing it’s value, but professional quality software is still reaping tons of money. But companies need to watch the split between consumer and professional lines. For some companies Google, Apple, FB its all about giving the consumer cheap “free” products, with hopes they can sell off all the data they collect, or going with cheap but with in product purchasing. For the professional driven software firms, Oracle, Microsoft, SAP, etc it’s still about providing top end tools for professionals. But they aren’t blind to the consumer’s personal pull to free cheap software, so most are creating software as a service products. AKA office 365, here pay 10 bucks a month, and get office, outlook, etc all the professional tools you love at home, just 10 bucks a month. Adobe maker of the expensive software suites galor doing the same thing, my product still costs 4,000 bucks but tell you what if you can’t afford that I’ll rent it to you for 40 bucks a month. This keeps their software where it needs to be priced but fills in the consumers desire for cheap software, but software that is good software. Which is the last point, Good software vs cheap / free software. Sorry but all the “Open source” software usually has so many bugs, holes, security nightmares, or just lack of any standard that you basically can’t use the stuff in a professional manner. I know the first reply but tons of big companies use them, like facebook, blah blah, well facebook uses it and has a team of over a hundred developers, that are top of the crop programmers that rewrite half the core pieces they use, and for what? I high scaling website that is nothing more than a single column data grid. Aka the site’s not really that complex at all, just had to scale well is all. That is where people forget to look, they see a site using free software that is a “big user base” and instantly think they use it so it’s good right. But they never look to see how simple a site is, when making the comparision. My point though is cheap software is for geeks, general users can’t / won’t be able to use it well. So they need professional grade consumer priced software, and MS and Adobe etc are providing it. with rent a software setups. Which overall really make them more money than if the user bought the software right out, but… cause it’s cheap on a monthly bases it’s appealing to everyone. Just look at their xbox360 deal. Get the full hardware kit for 15 bucks a month and that includes live pro. Yeah after the 2 year deal you’ve paid them an extra 50 bucks but… you got to play it during those 2 years, AND you the poor person were able to afford to have it. Microsoft on the other hand makes the cash for selling millions more. I have to agree with the replies that find this analysis rather lacking. The idea that software as a revenue basis is in decline based upon a few large, freely available applications is not enough to support such a contention. In addition, this analysis, like many similar ones is based upon the new fad that is carrying Apple to such dizzying heights, which is mobile computing. Mobile computing, for the most part is used for frivilous access to online resources. Serious users use it as merely an adjunct to their business requirements. Hopwever, this latter group is not nearly as large as the former. The conclusion is that due to the popular and frivilous nature of mobile devices they will suddenly supplant serious usage of more established platforms such as the desktop and the laptop. This simply will not happen given the constant increases in complexity with the development of applications for business and science and few if any of these applications will be designed for mobile devices other than for lookup. Dave Shields makes what I would consider a very valid point. The publicly available software projects mentioned in this article are infrastructure projects. Considered individually, they have no value to an end user. These projects are used as part of a project that is providing value to the user. Not all of Facebook is available as open source. The parts that make Facebook unique are what provide value, and you will not find these parts on GitHub. would have another revenue stream like Google. generate enough revenue to support software teams. operate their instruments, which sell for more than $200,000. developers will continue to use PCs. be much more mobile and flexible than notebooks. But, there will be a PC back in their office. The main reason for the difference in the share price between 1999 and today, is the 2 for 1 stock split that MS did in 2003. The price of a share went from $48 to $24. The fact that the stock has only risen to $30 in the last 9 years shows that there is malaise for sure. However it’s not as bad as your introduction makes out.